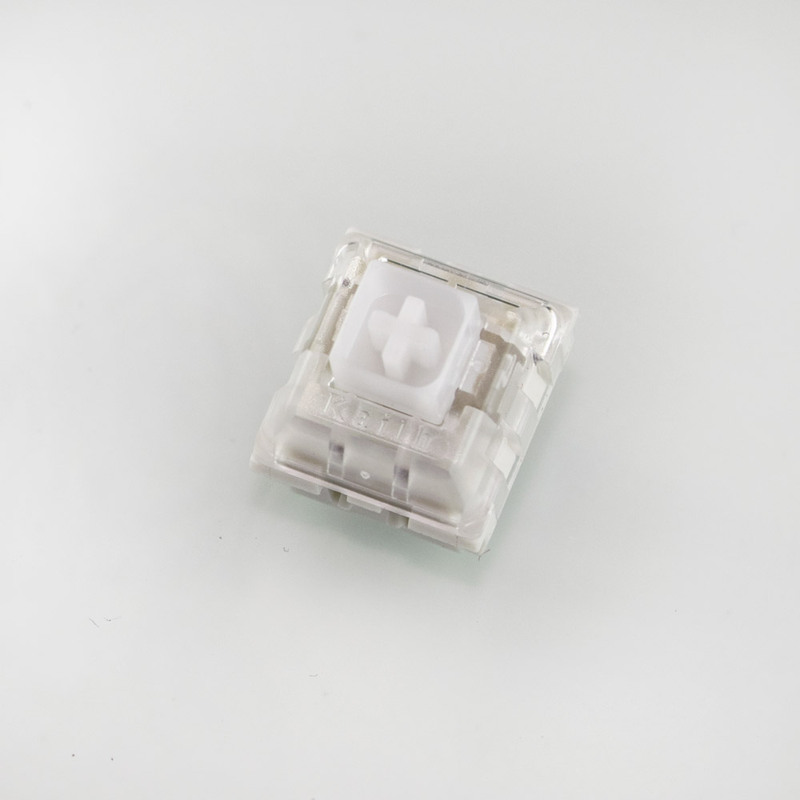 Hako Clear switches use Kaihua’s box architecture in an effort to combine the best characteristics from Cherry MX Clear and Topre designs. After the release of Halo Clears, which provided invaluable research and development data, Jacob Alexander furthered the hybrid concept with this radical new switch. Hako Clear begins with a very slight preload and exhibits a lighter, sharper tactile bump than Hako True. Though the two are close in terms of measured press-force, the Hako Clear may seem lighter than the True due to its force curve layout. It borrows sweeping initial curves from Topre and combines them with the springy finish found in Cherry MX Clears. The longer, less dense spring is partially responsible for that element of its feel. Hako Clears discourage bottom out, but not as strongly as Hako Trues. It should also be noted that the Topre-like elements of Hako Clear are subtle, not dramatic. As is the case in most box switches, force curve inconsistencies do not translate to actual press-feel. Jagged portions are intangible during slow presses and fast typing. Hako Clears implement all improvements found in the box switch architecture. Per-switch drains and protected contacts minimize spill impact, the structure itself reduces stem wobble, and plastic on plastic contact actuation reduces part wear for increased longevity. The plastic on plastic system also increases smoothness. Input Club’s bespoke slider design further reduces stem wobble, which is endemic in traditional switches. Hako Clears aren’t a particularly noisy switch, and they are quieter than Hako Trues, but some rasping from the plastic on plastic contacts is audible. It doesn’t translate to press-feel, nor is it significantly louder than traditional plastic on metal actuation systems. Those tend to have a mix of metallic and plastic rasping sounds.